Idea of extension tubes is to get some distance between lens and camera's sensor. By doing this the minimum focusing distance will get smaller and magnification increases. Basically picture projected to sensor is enlarged and therefore also distortions are enlarged. Due to enlargement also some light is lost. I use extension tubes to use my non-macro lenses to take close-up / macro photos. For real macro photos I prefer my macro lenses, but some times it's not possible to carry all lenses or the ugly bokeh of Canon EF 100 f/2.8 USM Macro is not suitable for the photo. For example Canon EF 200 f/2.8 L USM Mk II and Canon EF 85 f/1.2 L USM Mk II are good lenses for flower photography with entension tubes - both have excellent image quality (the magnifigated image is still usable) and have excellent bokeh. Due to these reasons formulas may not give exact figures but they can be used to estimate what kind of effect is going to happen when extension tube is used. By using this formula and lens manufacturer's information what is the magnification of the lens itself. This light loss is happening in addition to light loss happening when lens is focused. You can calculate your lens' own extension while focusing with formula: "lens' own extension" = Focal Length * Magnification. I used in this example Canon EF 85 f/1.2 L USM Mk II which has minimum focusing distance of 95cm and maximum magnification 0.11x. Below calculations show the formulas when this lens is used with 12mm Extension Tube and aperture f/1.2 on full frame camera (sensor 36mm x 24mm). Therefore the total magnification at minimum focusing distance is 0.11 + 0.14 = 0.25 and 0.14 at infinity. Canon makes two extension tubes: EF 12mm Extension Tube II and EF 25mm Extension Tube II. These are quite expensive considering that there are no optical elements, just air. Due to this I ended up purchasing Kenko Extension Tubes, which cheaper alternative and more versatile since the set contains 3 tubes. 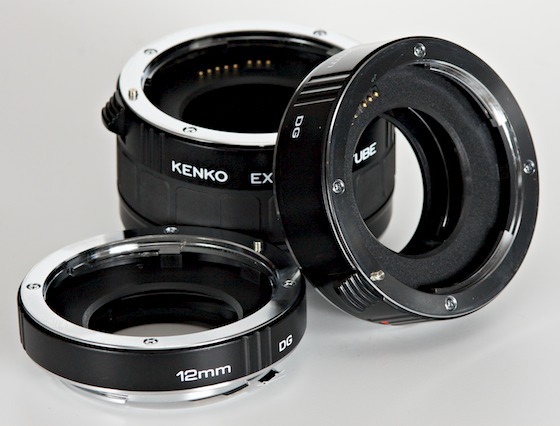 Kenko Extension Tubes are providing full electrical connection between the lens and camera. I have never had any problems (e.g. Err-99) with the Kenko tubes. Tubes can be used one at a time or then they can be combined. Therefore following extensions can be achieved with the tube set: 12mm, 20mm, 32mm, 36mm, 48mm, 56mm and 68mm. Generally I don't have any complaints about the Kenko extension tubes. Some users have mentioned that they have dropped their lens since it's too easy to press the lens release button. The release button haven't been problem for me.